To club paddler Rachel Syme who was named one of 2 Runners-Up in the Youth Category of Kirkcaldy & Central Fife Sports Council 2014 Awards at a ceremony in Fife College on Thursday 26 March. Rachel was recognised for her achievements in the 2014 season which included representing Junior GB at the Olympic Hopes Regatta in Piestany, Slovakia in September. 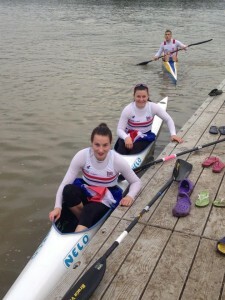 She is currently attending a Junior GB Training Camp in Portugal prior to the first national sprint regatta of the year in Nottingham in April. The new season of Kirkcaldy Canoe Club will resume on Tuesday 31 March 2015 at Kinghorn Loch. For the first 2 weeks only, sessions will start at 6 pm to enable all administration details, such as fees, subscription forms, etc to be completed. The club membership form is available to download on the club website and it would be appreciated if this could be completed prior to arriving at the Loch. Alternatively, for those members who do not train regularly at the Loch, forms can be downloaded, completed and posted to Mrs K along with a cheque for the appropriate amount. If you require Mrs K’s address, please contact the Club Secretary. Loch Leven is both a very important European-designated Reserve, famous for its over-wintering bird population, and that prior to the Land Reform Act, paddling on the loch was strictly forbidden. Disturbance of the birds is an offence, punishable by heavy fines. The SCA regularly liaises with Scottish Natural Heritage (SNH), who warden the Reserve, and over the years a rapport built up; paddling was introduced, firstly in the Kirkgate area only (the part of the loch nearest to Kinross), then out into the loch, and in the past three years to Burleigh Sands, giving a more interesting trip. Due to European legislation, it is possible still to go back to banning all water-sports, even with the Land Reform Act, but the owners and SNH as managers do not wish to do this. ‘Non-compliant behaviour’ on the loch includes; paddling towards flocks of birds on the water; landing on any of the islands (strictly forbidden), and landing anywhere other than Kirkgate and Burleigh Sands. This might sound quite draconian, but at least there is access on to the loch. Paddlers wishing to practise on flat water have always been welcome, and a few people do paddle all year round on this small part near Kirkgate. The number of ‘non-compliant’ canoe trips has always been small, but during 2014, the numbers increased substantially, to the rate of maybe two groups a week during summer months – about half of these were ‘non-compliant’ , and in talking to the Rangers there, it seems that quite a number of these were ‘properly-equipped’ paddlers in expensive boats, not first-time paddlers. This is therefore a plea to our Members to please abide by the rules, or banning could happen – and also as responsible paddlers, to look out for, and advise non-member paddlers. There is quite ample signage around the loch, but this will be reviewed currently before the 2015 summer season; if in doubt, any paddler should call at the SNH office on the quay next to the angling centre. In addition, we are seeking a local volunteer who would be willing to be a contact with SNH at Loch Leven. The job is not onerous, maybe two meetings a year, and the ability to be called upon occasionally if there are any special problems. We rely on volunteers to deal with many access issues, and the best way is to use local paddlers who know their area. If you are interested in taking up this role, please get in touch.